I love old comic advertisements. With my background in marketing and having worked as a comics retailer, I find this stuff fascinating! 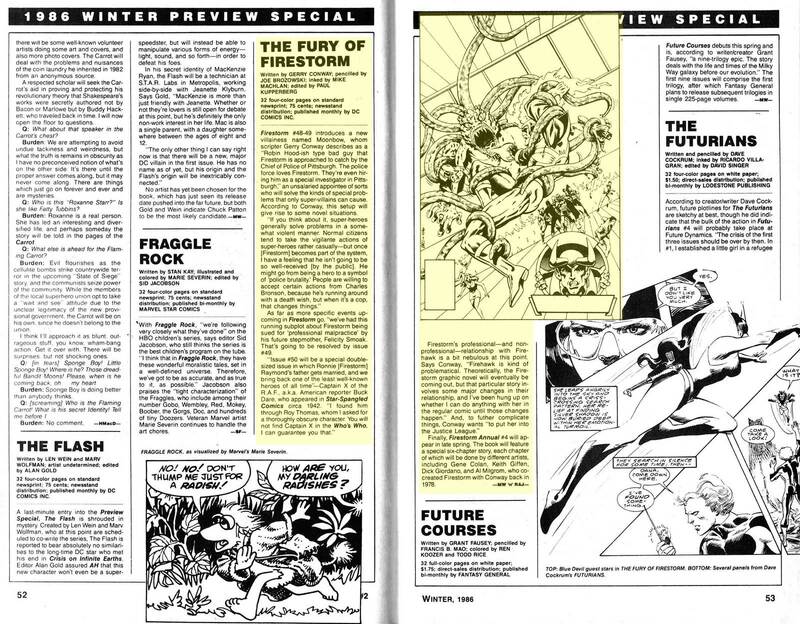 Today we’re featuring a number of Firestorm promotional blurbs from Amazing Heroes. 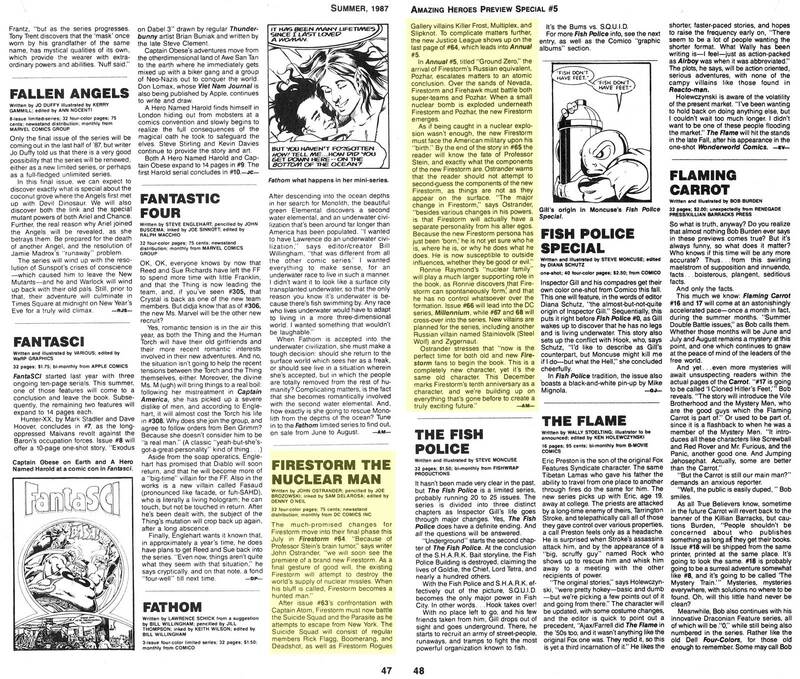 If you’re not familiar with Amazing Heroes, it was a magazine about comic books published by Fantagraphics Books from 1981 to 1992. 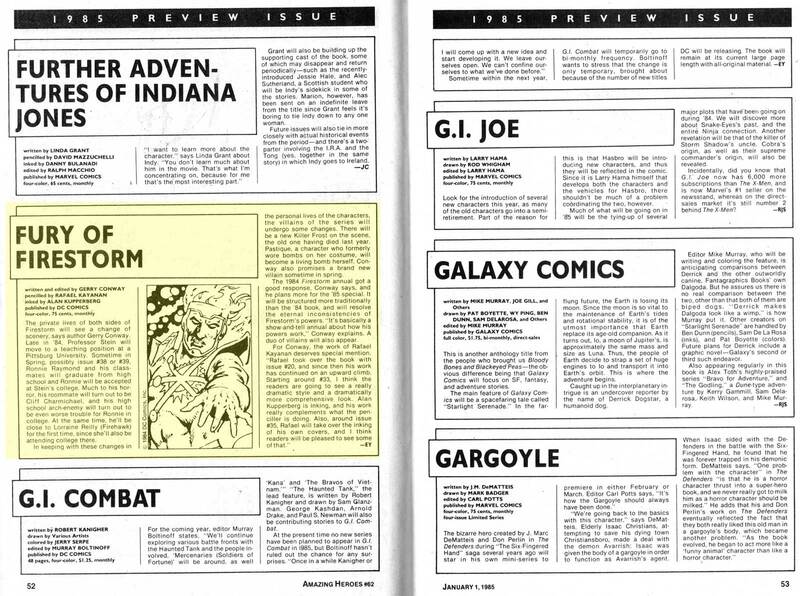 It regularly featured industry news, comics creator interviews, histories of comic book characters, and reviews. 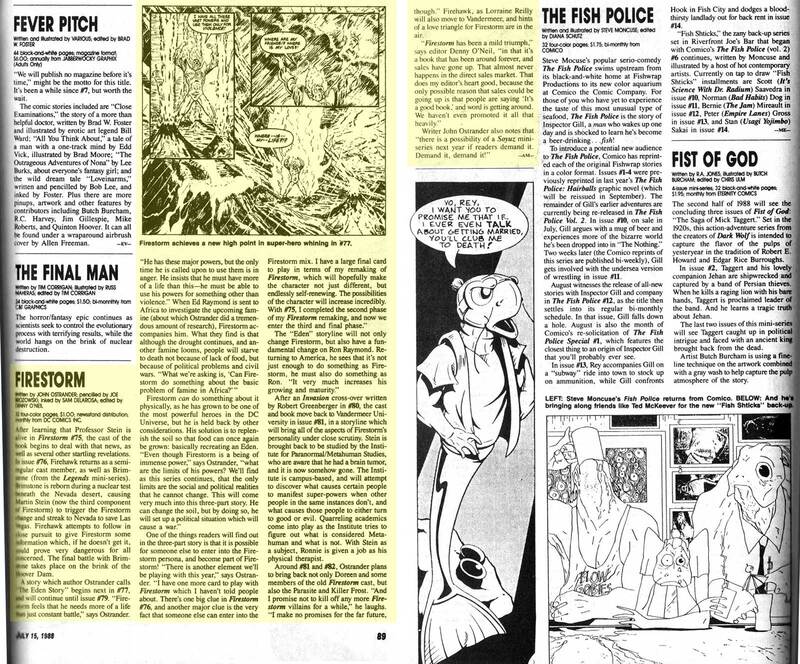 It was the precursor to publications like Wizard Magazine, but without the price guide and overly-hyped content. These promotions cover issues starting around Fury of Firestorm #22, and run all the way up to #100. One of the things I love is finding plots or concepts in the promotions that never appeared in the comic. These were story ideas the author was considering while planning future months, but ultimately chose not to pursue. I find those “road not taken” ideas fascinating. 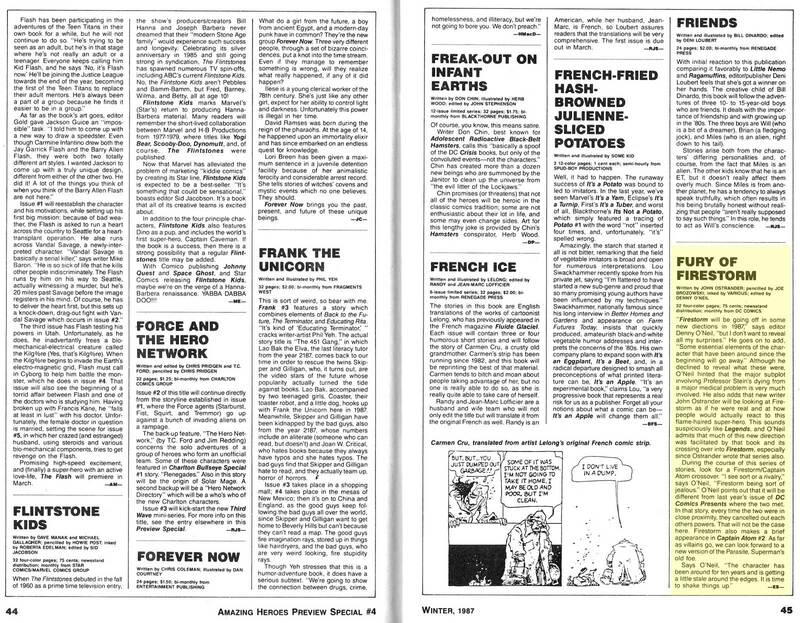 These scans were compiled by Match-head and Nuclear Sub, Joe X! My apologies to Joe for taking so long to post these pages. He sent them to me way back in July 2014! Sorry, Joe! I chose not to crop the surrounding page(s) as they make for fascinating reading. 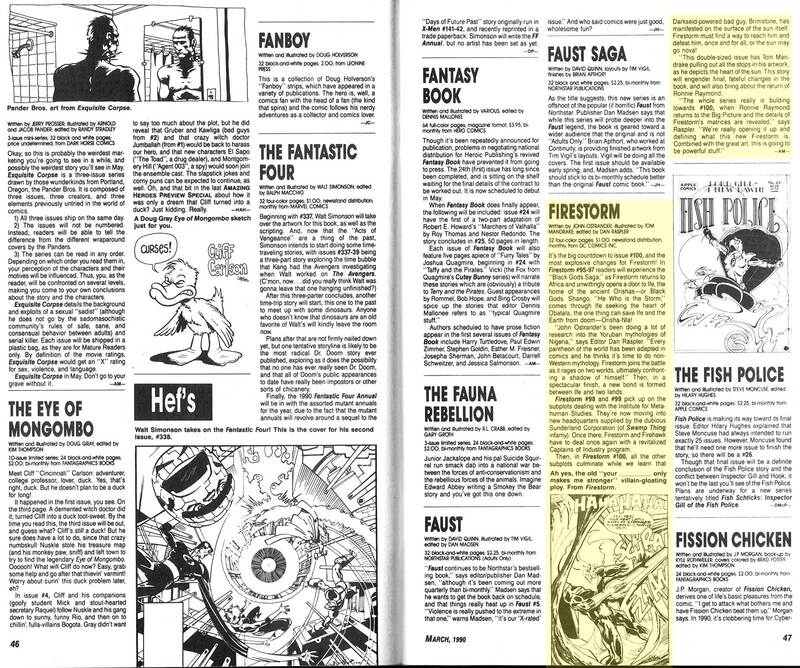 You’ll notice the Firestorm entries have been highlighted in yellow to make it easier to find. Click each image to enlarge and read! 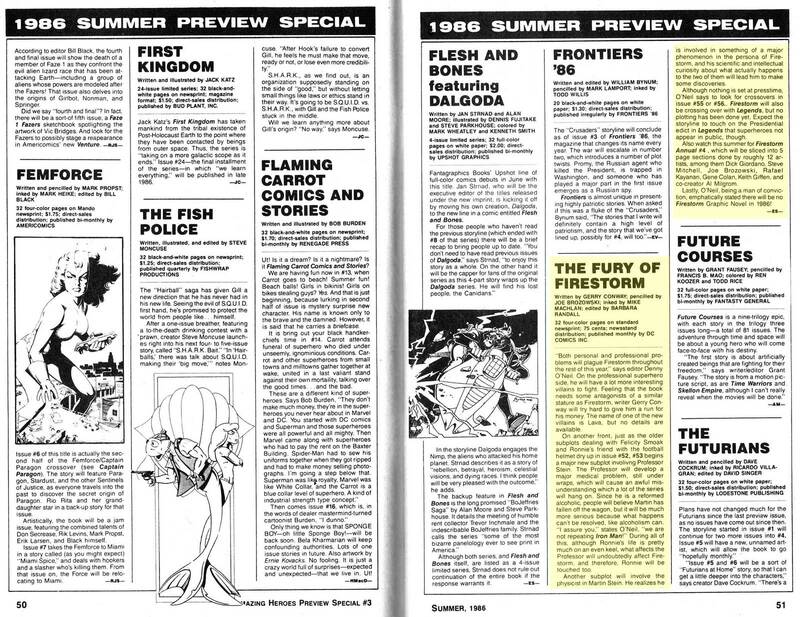 Note the mention of the never-published Firestorm Graphic Novel. Man, I would have loved to have seen that book! Note the mention that Cliff Carmichael will be Ronnie’s roommate in college. I don’t recall that happening, but to be honest it’s been a while since I read issues in the 40s & 50s. I may be mis-remembering. Note the mention of Firehawk joining the Justice League! Wow! This was during the Justice League Detroit era, so Firestorm was no longer on the team. That would have been fantastic to see Firehawk battling crime without Firestorm. A real chance to spread her wings (pun intended) and show the readers she’s a strong independent character. 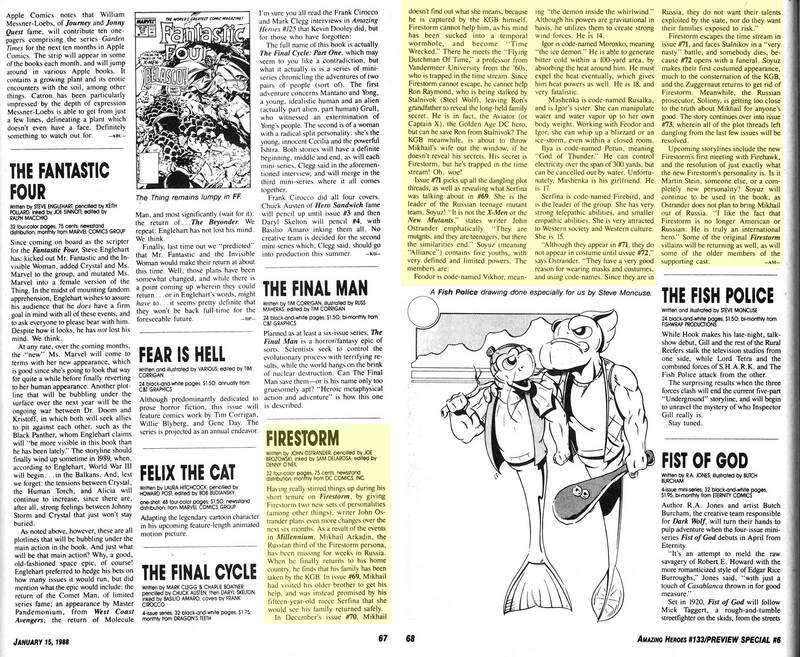 Also, another mention of the never-published Firestorm Graphic Novel. 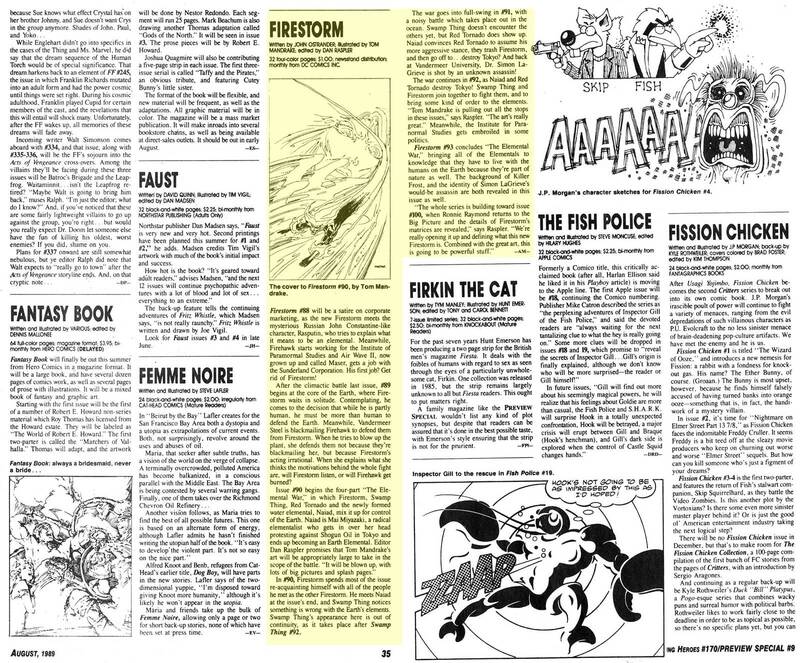 Note the interesting ideas about Firestorm working for the Police and concerns of brutality. That would have been an interesting plot thread to see develop. Another mention of the never-published Firestorm Graphic Novel and Conway’s hope to place Firehawk in the Justice League! This one is a little sad. This promotional copy would have been written about the time Gerry Conway was let go from the Firestorm book. Notice editor Denny O’Neil is being interviewed instead of Gerry. Many of these ideas were either never realized, or written by subsequent writers. There is mention of a new villain named “Lava” that never appeared. Also, Denny definitively put an end to the hopes of a Firestorm Graphic Novel. Shades of the Blank Slate Firestorm being hinted at here. Pretty much everything here happens exactly as they described (except the spelling of Zuggernaut). I’m surprised they gave away so much of the plot in this preview magazine. I’m glad I didn’t read this before the issues; all the surprises would have been spoiled! Again with the major spoilers! Geez! Save your 75 cents kids. Read this and you don’t even need to pick up the issues to know what is happening! More issue by issue spoilers this time. 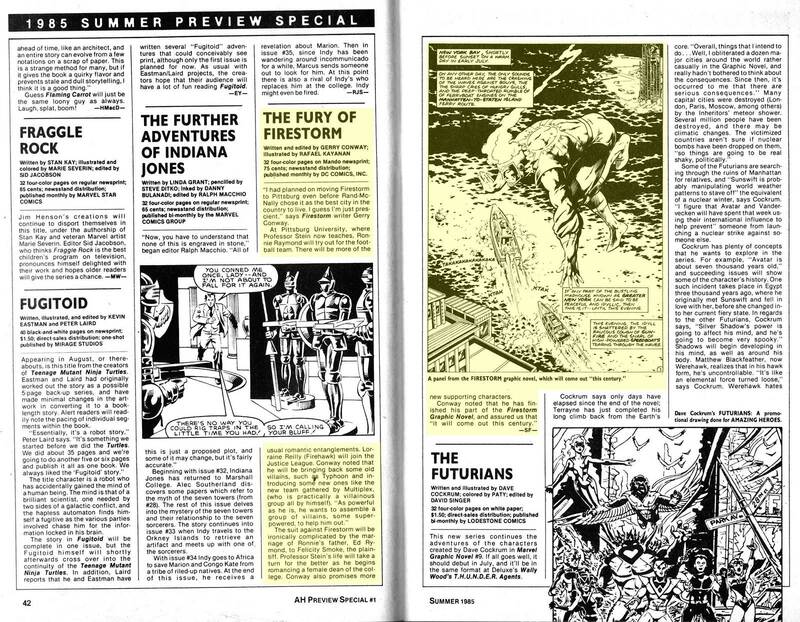 Plus, a nice mention of Firestorm’s rising sales, and suggestion of a Soyuz mini-series that never materialized. Building towards the Elemental Firestorm storyline! Interesting that they compare Rasputin to John Constantine. Plus an abandoned plot of Doreen in trouble. Man, it would have been great if the Parasite had eaten Doreen! Whoa, satire? We’ve come a long way. A slight hint about the series ending with issue #100 in the phrase, “… final, fateful changes…” Other than that, no real way to tell the adventures of our favorite Nuclear Man (or Elemental Man by this point) would be coming to an end. What a fun trip down memory lane! Plus some new realizations about abandoned plot threads. My thanks to Joe X for sending these my way! Posted in: Advertisements, Comic books, Firehawk, Firestorm #01: Original (Ronnie/Martin), Firestorm #02: Blank Slate (Ron/Mikhail/Stein), Firestorm #03: Elemental I (Ron/Mikhail/clone), Firestorm comic vol. II, Gerry Conway, John Ostrander, Justice League of America. Wow, what might have been. Firehawk in the JLD would have been a welcome addition. 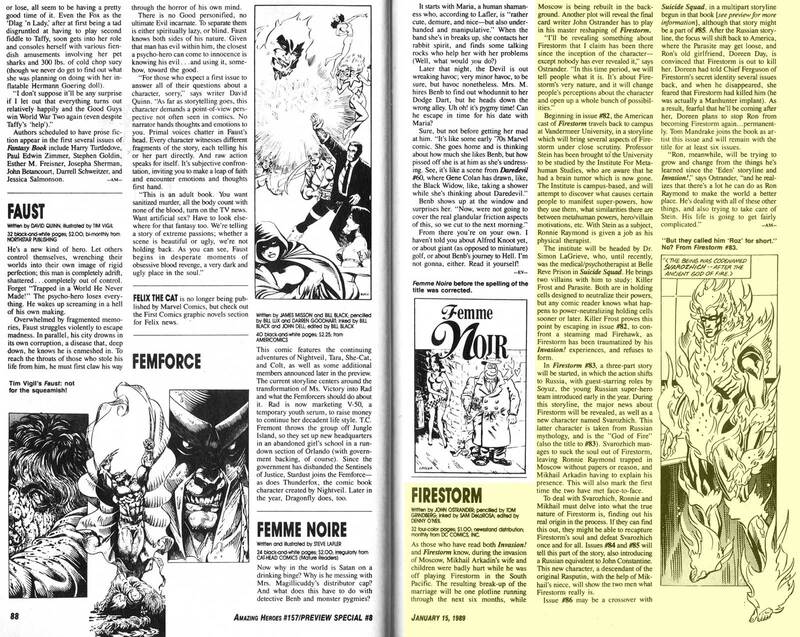 Looking at some of the other books, I’m not sure “The Image” ever showed up in GL, and that abandoned new Flash title, with no connection to the previous Flash, is mentioned. It think this is the largest piece of evidence existing on that lost project. It’s not a problem, I figured you could use them for a fill-in podcast or something. The Image never appeared, and Clay Kendall was one of the dead of Coast City. The Mac Ryan Flash I think was a pitch that Wolfman rushed into print, hoping it would secure him the gig. Instead, it was passed over for the Wally West series. Interesting. I didn’t know Wolfman pushed this to help cement the deal. I know he had Jenette Klyburn at STAR Labs call “Mac” Ryan in a Titans issue to kind of set it up, but that’s as far as he got. That’s just my supposition. You’d have to ask Marv or Len about specifics. It appears that editor Alan Gold had a hand in it as well, given that the quotes and info in the Preview blurb was credited to him. The Image appeared in full costume in the DC Sampler, and it was the preview in Amazing Heroes #39 that hinted that it would be the crippled Clay Kendall in some sort of psionic astral form. Sorry Xum. I could have saved you the trouble. Back in 2012 I did quite a bit of research on the “Corona” graphic novel. I touched base with both Gerry Conway & Pat Broderick regarding it. Gerry didn’t recall it, and Pat would just say it was a shame it was never published. I came to the same conclusion. I believe the “Corona” graphic novel was adapted to become the “Sparx” annual. Now reading these Amazing Heroes blurbs, sounds like Gerry was planning to use the exploration of the Firestorm powers in the monthly book, but didn’t get a chance when he was taken off the series. See the “Summer 1986″ blurb. I’ve always planned to do a post on the Graphic Novel sharing all the mentions, but haven’t got around to it. Maybe now I can get motivated to do this soon. BTW, I just pulled out my copy of Amazing Heroes #39 to re-read the (rest of the) Green Lantern entry again — and decided to also re-read the Justice League of America entry, which hints at the origins of the Justice League Detroit era by stating that JLA members that have their own titles will “take a leave of absence” and “stay away” in 1984. The reason behind it was an editorial issue (it would alleviate Gerry Conway, the editor of JLA, from having to coordinate with editors of other books that feature these JLAers). 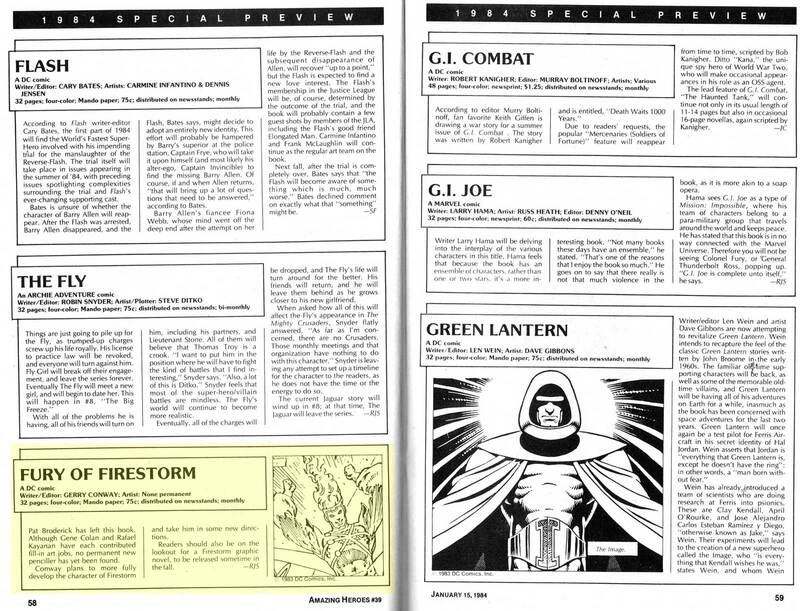 What is interesting is that this early-proposed version of the “new” JLA would have featured the current second-tier members and Firestorm was going to be the only JLAer with his own title to stay on the team, since Mr. Conway was writing both books. It is all on page 68.